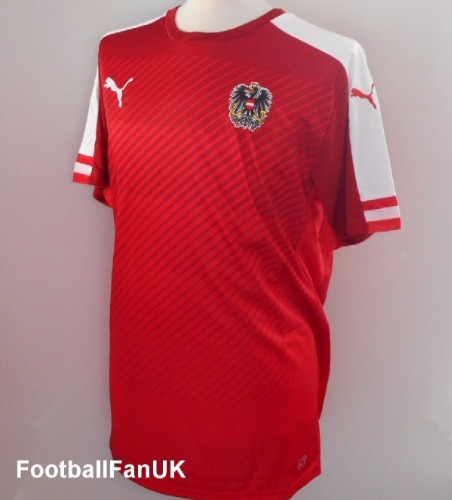 Official Puma Austria home football shirt for the 2016-2017 season and used by the team at the Euro 2016 finals, when they disappointingly finished bottom of their group behind Portugal, Iceland and Hungary. These shirts are new with tags in Puma packaging. - Red with diagonal graphic and white trim. - 'Immer Wieder Osterreich' printing inside neck. - Puma authenticity patch with individual serial number. - Puma product code 748683-01. - Adult size Large. Chest 43". length 29".